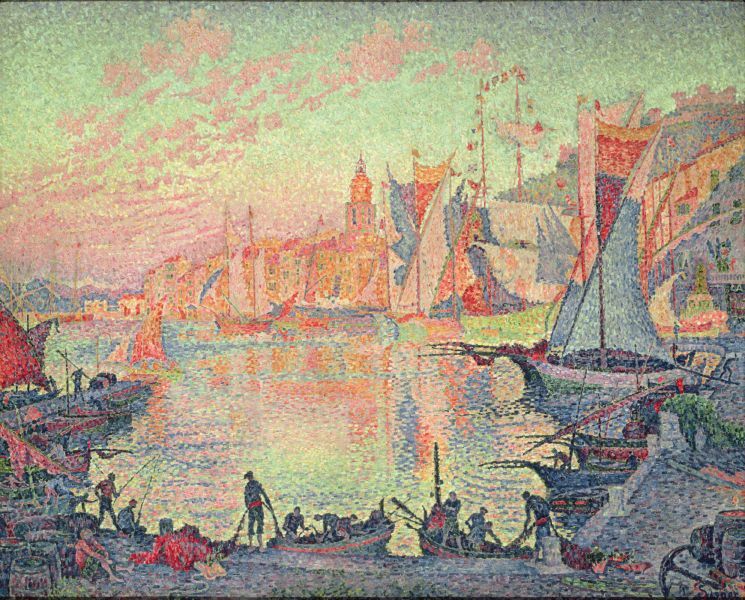 A luminous painting of the port of Marseille in dawn light, looking up towards the ‘Good Mother’ church, marks the height of both Neo-Impressionism and Fauvism. Collection Metropolitan Museum of Art, New York. The port of Marseille, captured in the rich light of dawn, looking east towards the hill on the top of which is the seamen’s ‘Good Mother’ church. On the left are sailing boats with their sails part-furled and limp in the calm. In between them the bows of two larger vessels project from the left edge, and behind them is the distant forest of high masts of sailing ships. A rowing boat is passing just on the right of them, towards the viewer. On the right is a cluster of similar small boats, moored and with occasional figures at work on them. The lower half of the painting is otherwise filled with the gently rippled water surface, reflecting muted pinks, gold, blues, and dark greens. Towards the back of the water, near the centre of the painting, a small steamboat crosses from left to right, its thick pink-purple smoke billowing towards the left. Across the far side of the water are glimpses of larger steam and sailing vessels, with the tall masts of sailing ships in groups on the right. Behind them, in the hazy, smoky background, buildings rise up the sides of a conical hill. On its left slope is large angular stonework. At the top of the hill is the church, its tower and spire reaching towards the top of the painting. The sky is suffuse pink and purple on the left, changing gradually to pale turquoise and more intense gold behind the hill and to the right. The painting is constructed from a great number of small rectangular tesserae of paint, coarser-grained in the foreground, finer and almost merging in the distance and sky. Its overall effect is of luminous and vibrant colour. The painting was shown in 1906 at the annual exhibition of the Société des Artistes Indépendants. Paul Signac was born in Paris on 11 November 1863. After starting the training to become an architect, he went to an exhibition of Monet’s paintings, and decided to pursue a career as a painter instead. He met Monet and Seurat in 1884, as the latter was setting out the beginnings of Neo-Impressionism. 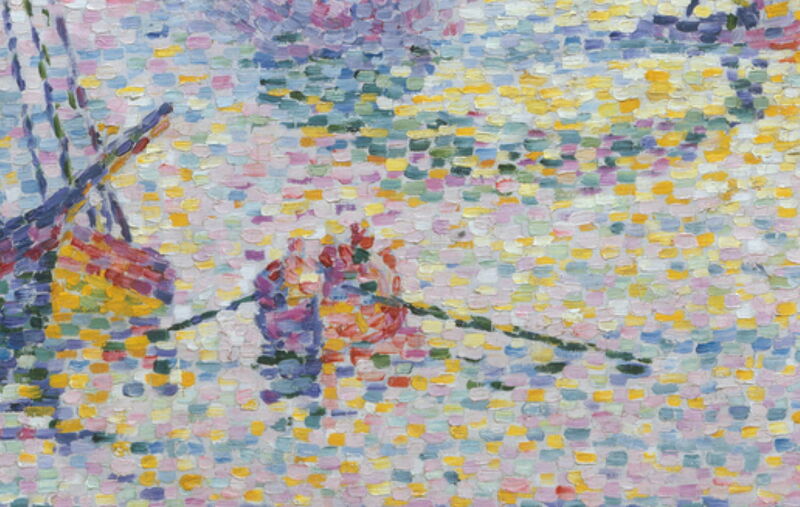 Impressed by the theoretical basis propounded by Seurat, he abandoned the small brush strokes of Impressionism for the tiny painted dots of Divisionism. He painted with van Gogh in 1887 at Asnières, and visited van Gogh at Arles in 1889, by which time he had become an anarchist alongside Pissarro. He was shocked when his close friend and the leader of Neo-Impressionism, Georges Seurat, died on 29 March 1891 after a brief illness. 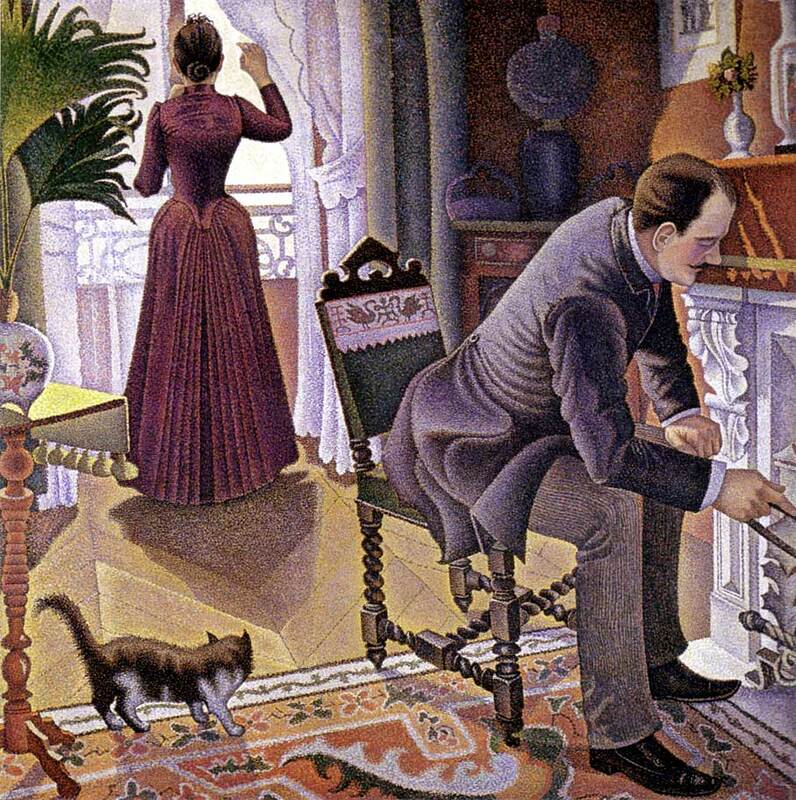 Paul Signac, Un Dimanche (Sunday) (1888-90), oil on canvas, 150 x 150 cm, Private collection. WikiArt, Wikimedia Commons. An avid yachtsman, he sailed extensively along the north coast of France and in the Mediterranean from 1892, painting watercolour sketches which he then turned into oil paintings using the Divisionist method (‘pointillism’). However by this time his original tiny dots had grown into small tiles of oil paint, his finished works resembling mosaics. 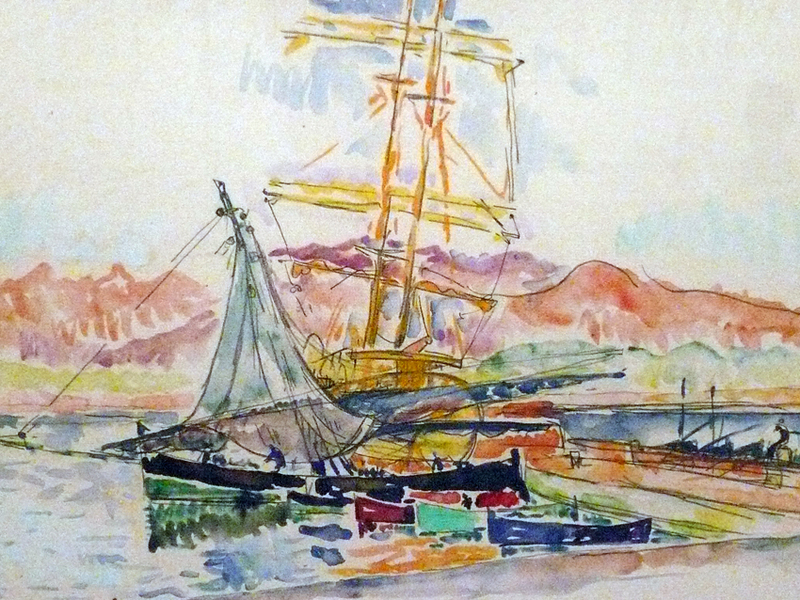 He later modified these techniques further, also painting brightly coloured watercolours which were akin to those of the Fauves and subsequent colourists. His motifs were largely marine, reflecting his love of the sea. 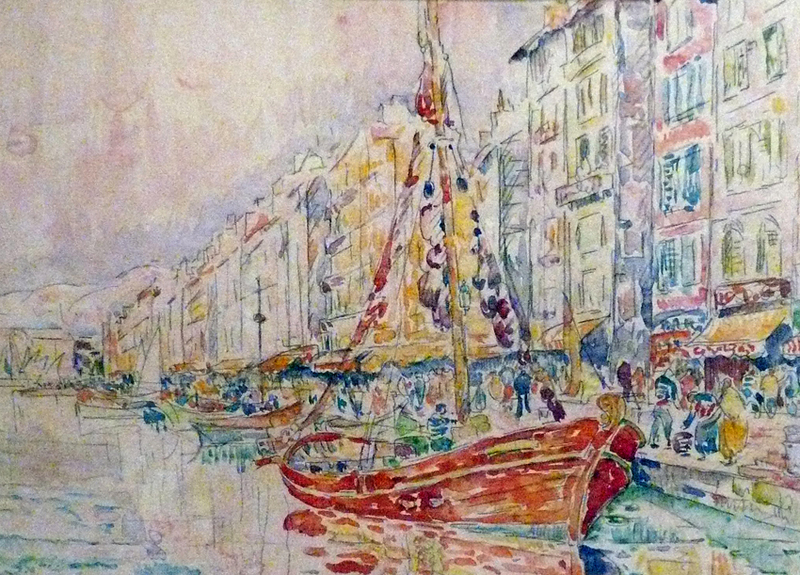 Paul Signac, The Port of Saint-Tropez (1901-2), oil on canvas, 131 x 161.5 cm, National Museum of Western Art, Tokyo. WikiArt. From 1897 he moved to the south of France, living at first in Saint-Tropez, which was undiscovered as a resort at that time. The area became popular with post-Impressionist painters, including Pierre Bonnard, who also sailed and settled there. He was president of the Société des Artistes Indépendants from 1908 until his death on 15 August 1935, seeing its members through Fauvism, Cubism, Orphism, to Dada. He was a major influence on Matisse and other twentieth century artists. Paul Signac, Avignon, Evening (The Papal Palace) (1909), oil on canvas, 73.5 x 92.5 cm, Musée d’Orsay, Paris. WikiArt. 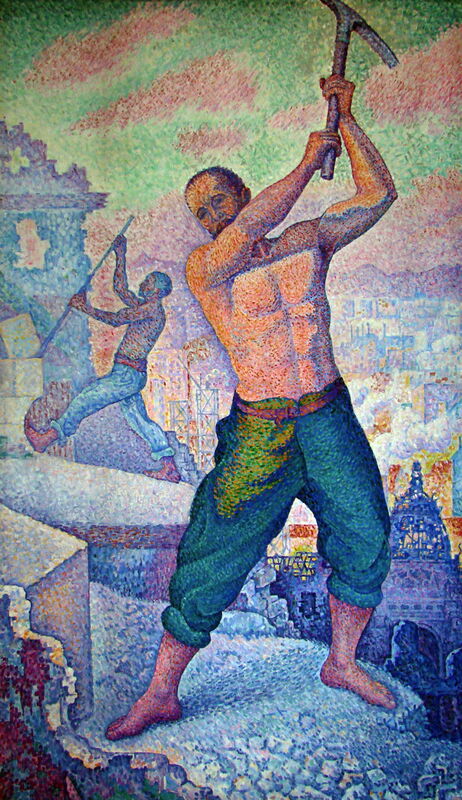 Paul Signac, The Demolisher (1897-9), oil on canvas, 250 x 152 cm, Musée de Beaux-Arts, Nancy. WikiArt, Wikimedia Commons. Signac’s career as a painter started at the height of Impressionism, as the Salon tradition was being swept away and some of the Impressionists, such as Monet, were achieving critical and commercial success. However he chose the radical option, to join Seurat in his new enterprise which was more firmly rooted in the art theory expounded by Charles Blanc, and the colour science and theory of Michel Chevreul. These in turn linked with the purer science of Hermann von Helmholtz. It is often stated that the American Ogden Rood’s writings were important influences, although that is less clear; in any case Rood’s book relied largely on von Helmholtz, who definitely was accessible to the Neo-Impressionists. The aim of the Divisionist technique was to paint in a manner similar to modern colour reproduction, by placing tiny dots of different colours close together, so that when viewed from a distance ‘optical mixing’ would occur, and the dots would fuse into more vibrant colour. Seurat had already demonstrated that monochrome drawing worked with finely textured Conté crayons when he started work on his first major Divisionist oil painting in 1883. 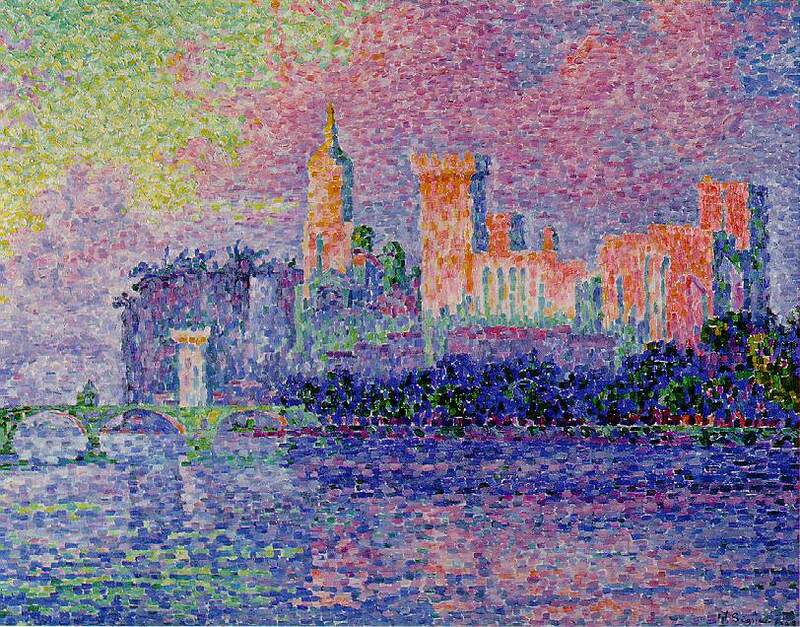 By the late 1880s, the Neo-Impressionists had swelled to include Signac, Charles Angrand, Henri-Edmond Cross, and others. The results of their experimental techniques were promising, but generally appeared rather hazy and lacking in intense colours or tones. The biggest problem, which forced Pissarro to return to more conventional techniques, was the time and mechanical effort required by the Divisionist technique: Seurat’s La Grande Jatte (1884-6), for instance, took two years to complete. Although not the first time that science and theory had been such major influences on painting, Neo-Impressionism was a distinctive product of nineteenth century scientific advances. 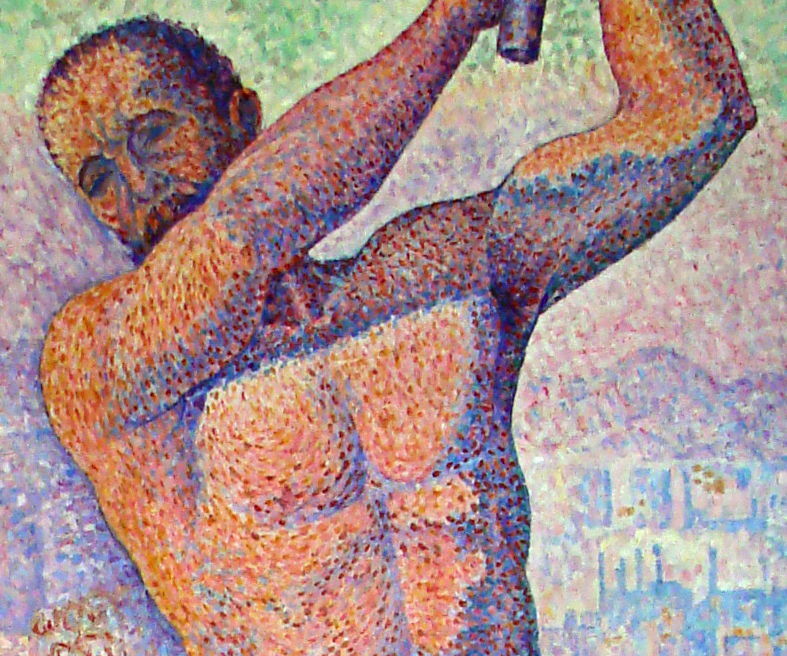 Those who stuck with No-Impressionism did so by modifying their technique in various ways, in Signac’s case by applying small tiles of oil paint, which allowed greater colour intensity to be achieved, and proved less mechanical and exhausting. Over time his tiles became larger, and some finished works resembled mosaics more than oil paintings, then they grew less regular and distinct. Signac eventually concentrated more on watercolour sketches with intense colours which were an important influence on the Fauves and successive colourist movements. Much of this development, and subsequent movements in painting, took place under the bright sunlight and in front of the intense colours of the south of France, the Midi, in what became known as le grand atelier du Midi (the great workshop of the Midi). A major factor in enabling this was the developmment of the French railway system, which reached from Paris to Marseille by the end of 1856, and connected much of the Mediterranean coast by the end of 1860. This enabled Cézanne to spend periods in or near Paris and at his family home near Aix-en-Provence, and ensured that Signac and his contemporaries could travel easily and quickly between motifs and studio. When Signac and successors first arrived on the coast, it was relatively unspoilt and many of today’s densely populated and popular resorts were still small fishing villages. It was not until after the First World War that they started to become tourist havens, developing during the heyday of fashion in the 1920s, and the advent of the car. 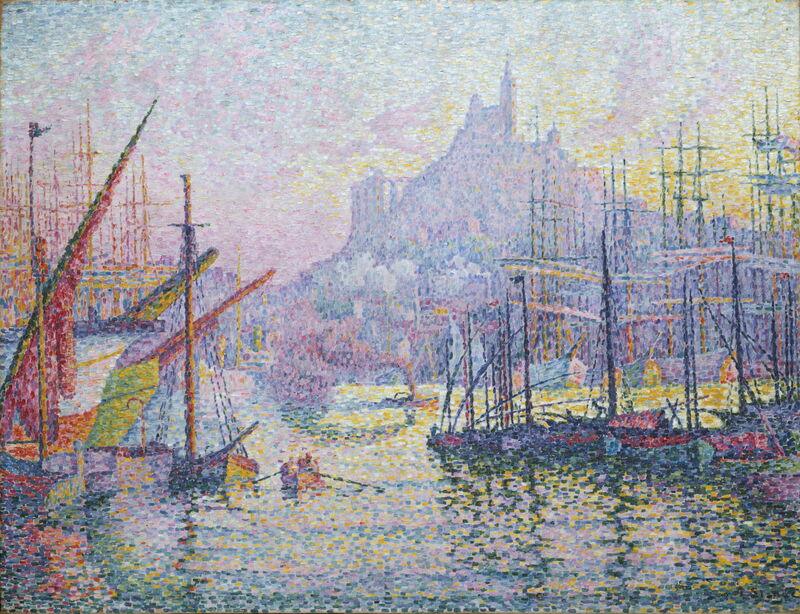 As a technique, Divisionism had proved a dead end, but the vibrant studies of light and colour produced by Signac and others form a unique record of the Midi at that time, and had a lasting impact on painting. 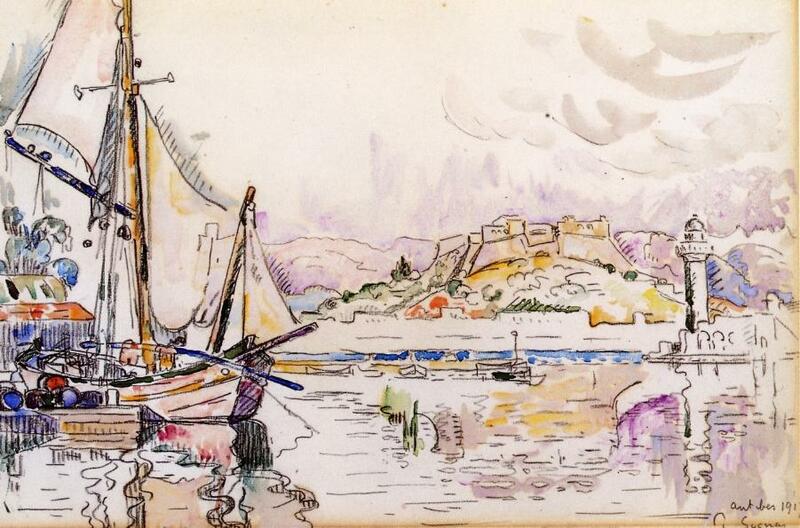 Paul Signac, Corsican Landscape (Ajaccio) (1931), watercolour and graphite, 28 x 43 cm, Musée National d’Art Moderne, Centre Pompidou, Paris. WikiArt. 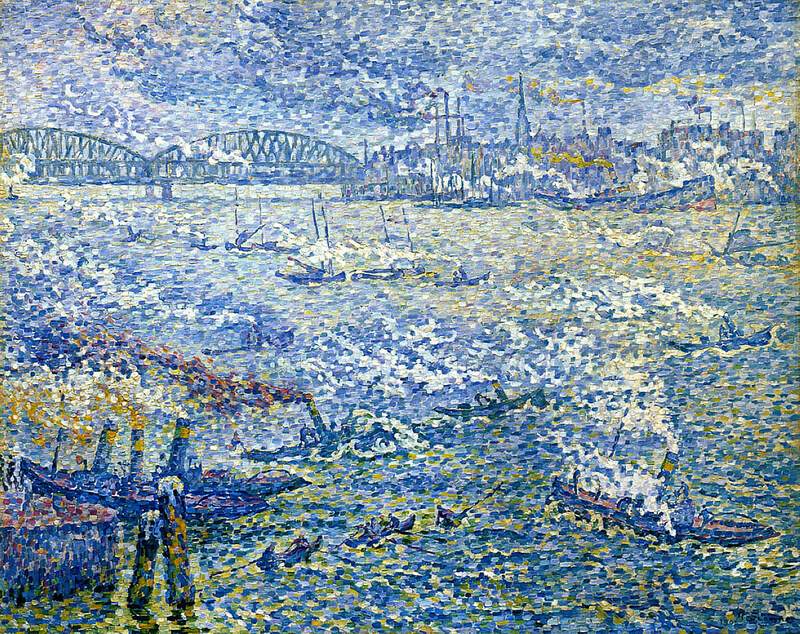 Paul Signac, Steamboats, Rotterdam (1906), oil on canvas, 73 x 92 cm, Shimane Art Museum, Shimane, Japan. WikiArt. Posted in Painting and tagged Charles Blanc, Chevreul, colour science, colour theory, Divisionism, Fauves, Matisse, Neo-Impressionism, Ogden Rood, painting, Pissarro, pointillisme, Seurat, Signac, von Helmholtz. Bookmark the permalink. Howard: This is absolutely brilliant. What a magnificent sense of art and the artist you provide. I have been enriched by your work, and it is greatly appreciated. Thank you so much for your very kind words, Lew.